Following our newly awarded affiliation with Major League Baseball’s RBI Youth Initiative, Friends of Baseball will open six new after school programs in the area. Six new school communities in N/NE Portland and East Multnomah County will have the opportunity to swing for the fences after school with Portland Diamond Project’s investment in Friends of Baseball (FOB). A nonprofit in the Portland Metro area, FOB received their official affiliation in February through Major League Baseball’s (MLB) Youth Initiative for their award-winning baseball-inspired after school and summer enrichment programs. FOB was awarded the affiliation with Reviving Baseball in Inner Cities (RBI), MLB’s youth initiative to provide young people from underserved and diverse communities the opportunity to play baseball and softball. Full Count is Friends of Baseball’s after school and summer youth program that, since its founding as a one-week summer program in 2015, has grown to serving 12 communities in four school districts in the Portland metro area, providing after school enrichment for more than 600 students. More than 80% of the youth who participate in Full Count are youth of color and 75% participate in the free or reduced-price lunch programs. Portland Diamond Project, the group working to bring Major League Baseball to Portland, is underwriting a position with Friends of Baseball through Up2Us Sports, a sports-based youth development organization that trains and places coaches in nonprofits across the country to support and mentor youth. The hiring of this new Program Mentor position will allow Friends of Baseball to open programs in six new school communities serving a high percentage of youth of color and low-income youth in 2019. This position is an AmeriCorps service term of one year for 900 hours and total compensation starts at $15/hr. “We are working hard to keep up with the demand for our Full Count program. This support from Portland Diamond Project makes it possible for us to be more responsive to this need from our partners and accelerate our progress toward our goal of being in 20 schools by 2020,” said Executive Director Nova Newcomer. Newcomer will be a featured moderator at the RBI Institute being held in Birmingham, Alabama over the weekend (March 14-17). Just 4 months into our $100,000 campaign to open up 10 new Full Count programs, our scorecard shows you have helped us raise through donations and grants a total of $59,300 toward our goal of opening up 10 new Full Count summer and after school programs. Check out our Facebook gallery below of some of the fun we had at our “Can I Play?” Gala helping to bring the life lessons inherent in the game of baseball to underserved youth! ​Stay tuned for the launch of our new website and fun, easy ways to say “Yes!” to our kids. In the meantime, you can help us toward our goal of funding 5 more programs by donating to our Can I Play? campaign. If Only our kids played on safe fields. If Only coaches were provided with the training and resources they needed. If Only families didn’t have to worry about affording that glove. If Only every child had the chance to play. On Friday, September 23, 2016 at Oregon Golf Club, we will convene again to show you what is possible when we answer, “Yes” to this question for the most underserved youth in our community. Like last year, we will have an engaging program and live auction with “can’t get anywhere else” items and bring together hundreds of business and community leaders to support the engagement of our youth through baseball– inspired educational programming. But this year, our vision is bolder. We want to launch Full Count in 10 new schools this Fall and Winter. Please answer “Yes” with us and join us at this inspirational event. Excuse our absence…Been busy on the field! Well as you might have noticed, it’s been too long since we have provided some updates on the website! While it is no excuse, we have been very busy in the field, literally, on the ball field! It has been a fun season for us at Friends of Baseball, including three Portland Metro area summer Full Count enrichment camps, with the second and third camps just wrapping up. We have two more ahead to round out the summer! What a blast it has been! This doesn’t include our pilot camp up in Seattle WA, in partnership with a fantastic organization called Baseball Beyond Borders, a community development organization providing developmental teams in the 16U and 18U age divisions through Inner-City schools in the Seattle area. Since it is a pilot run, it is a scaled down version of our traditional Full Count Camp, it is a one day a week camp, weekly through the month of July and into August. Important to have our programs expanding across the Pacific Northwest — but you don’t have to believe us — you can tell from the smiling faces below! Opening Day was fun for us too! Not only did we get to celebrate it with our Partner Green Zebra grocery in North Portland kicking off the 2016 season, we also had the chance to give back to our friends at the Mariners. Specifically to a special kind of person by the name of Miles. Miles is an usher at Safeco field and has been for years, and he has made it his mission to keep the love of collecting baseball cards alive by handing out (from his own collection mind you) baseball cards to each young fan walking through his gate to Safeco field. We had the chance to replenish his stash of cards thanks to a generous gift from a local, true Friend of Baseball, Bruce Kracke. It was an honor to meet Miles and the smile on his face when we surprised him with over 10,000 cards — was priceless! Off the field, we have also expanded our board with 2 new members (Cindy Nichol and Drew Hagedorn) who we will introduce further after they have had a chance to get their feet wet. We just conducted our yearly strategy meeting in June. Both Cindy and Drew are jumping right in to get involved from the get go! Nova and the rest of the FOB board can’t wait to utilize their skills and passion for youth baseball and softball in the NW as we continue with our Can I Play initiative! And finally the biggest reason we are in transition, we are working hard to update our website, which we are very excited about! Not only will it be more informative, but easier for you, our visitors, to help contribute to the amazing game of youth baseball in the NWthrough FOB. Please stay tuned for the big reveal…coming soon! As we continue to finalize the website, please be patient. 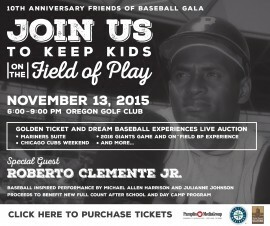 Keep in touch with us through FaceBook and most importantly, come and see us for our Gala on September 23rd at the Oregon Golf Club (for information, email nova@friendsofbaseball.org). In the meantime, I hope this update provides a glimpse into what we are up to and a chance to say THANK YOU to everyone who has supported our efforts over the years. As we always say…#baseballbuildscommunity. When MLB Com­mis­sioner Rob Man­fred issued his let­ter around this time last year, we were so inspired and moti­vated to learn that his pri­or­i­ties for Major League Base­ball aligned so well with our pri­or­i­ties to Keep Kids on the Field of Play. That’s why we were hon­ored to have Com­mis­sioner Man­fred par­tic­i­pate in our 10th Anniver­sary Gala from afar with his spe­cial video mes­sage and con­grat­u­la­tions not just to our Founders, but to ALL OF YOU who have been there along the way to help us help more kids. In 2015, we TRIPLED the num­ber of schol­ar­ships we pro­vided to boys and girls to play base­ball and soft­ball across Ore­gon and SW Washington. We launched our Full Count After School and Day Camp pro­gram and are expand­ing to 2 MORE SCHOOL COMMUNITIES this win­ter! And we have so much more to come this year…stay tuned! The Seat­tle Mariners sent us a spe­cial hol­i­day thank you video mes­sage to our part­ners and sup­port­ers who have done so much for youth base­ball and soft­ball over Friends of Baseball’s decade of service. At our Gala in Novem­ber, we raised a lit­tle over $35,000 to help fund our new Full Count pro­gram to bring more youth to the game. We are proud to part­ner with the Seat­tle Mariners to build com­mu­nity through base­ball and have their sup­port at our 10th Anniver­sary celebration. Enjoy this spe­cial mes­sage from the Mariner Moose and his col­leagues and our front office friends, Gina Has­son and Bob Hellinger. And remem­ber base­ball is always just around the corner. To a fun and mem­o­rable 2016 year and season! We believe every child should have the opportunities to swing for the fences on the field and in life. Copyright © 2016 Friends of Baseball.